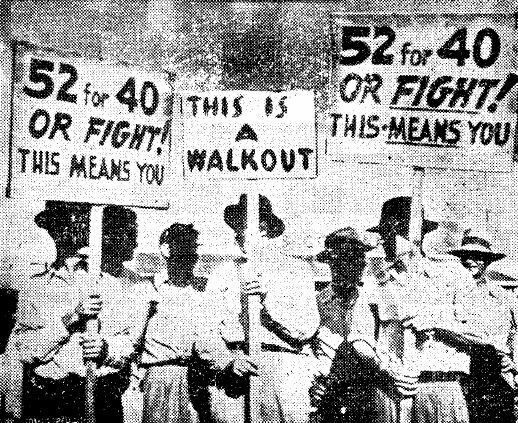 Jeremy Brecher on the huge, often unofficial, strikes which swept the US during and after World War II, despite the existence of union-enforced no strike deals. The institutional structures developed in the 1930s changed the relationships among workers, unions, employers, and government. Strikes during World War II and its aftermath share some but by no means all of the characteristics of earlier mass strikes. As in World War I, the government established a tripartite National War Labor Board, empowered to impose final settlements on all labor disputes. At the request of President Franklin Roosevelt, Congress passed an Economic Stabilization Act, essentially freezing wages at the level of September 15, 1942. The board retained power to make exceptions in cases of maladjustment and substandard wages. Further, the board could hold the threat of refusing maintenance of membership as a club over any unions that did not cooperate. "Even a stoppage of a few hours, when engaged in deliberately by a union, was enough evidence of irresponsibility for the Board to deny it the protection of the membership maintenance clause. "12 For example, on September 19, 1942, the board denied a union security clause for an AFL union at the General Electric Company in Buffalo because it had gone on strike for a few hours in June. At first, the power of the government and the unions, combined with general support for the war, virtually put an end to strikes. The chairman of the War Labor Board called labor's no-strike policy an "outstanding success. "14 Five months after Pearl Harbor was bombed, he reported that there had not been a single authorized strike and that every time a wildcat walkout had occurred, union officials had done all they could to end it. With the exception of a series of successful strikes by the United Mine Workers in 1943, the unions continued to play this role until the end of the war. The unions and the employers worked hand-in-hand to suppress the wildcats. For example, at the Bell Aircraft Corporation plant in Marietta, Georgia, employees in the electrical department, most of them women, left their jobs after the transfer of a supervisor. Union officials ordered them back to work, but the workers held out for six hours. Next they were called to a meeting in the plant labor relations office. Union officials told them they had forfeited union protection when they broke the no-strike pledge, then company officials handed out discharge slips to the seventy workers.26 In the Akron rubber industry, "some plants had work stoppages almost daily over minor grievances, dissatisfaction with wage rates." In a typical response, United Rubber Workers president Sherman H. Dahymple one week expelled seventy-two combat-tire-band builders who participated in a wildcat at General Tire and Rubber, and two mill-room workers blamed for leading a strike at Goodyear. This amounted to firing, Business Week reported: "was obliged to conform to the maintenance of membership clause in the rubber contracts and dismiss the expelled workers because they are no longer union members in good standing.... General and Goodyear are expected to notify the appropriate local draft boards of the dismissals, and the change in occupational status of the strikers may subject them to re classification. "27 When Dalrymple's home local, Goodrich Local 5, retaliated by voting to expel him for violating the union constitution, the union's executive board backed down and reinstated all but seven of the wildcatters. Detroit, the center of U.S. defense production, was likewise the center of the strike movement. Detroit papers had carried reports on a dozen strikes a week on the average for the first three months of 1944. At Ford, two or three a week was common. Occasionally they became violent. For example, a crowd of workers overpowered a plant protection man and demolished the office and records of a labor relations officer for whom they were searching. The president of the Ford local promised to take "whatever measures are necessary to wipe out rowdyism in Local 600." Twenty-six "ringleaders" were fired and ninety-five more were disciplined with the tacit approval of the UAW officials. "Implementation of this policy in the Ford case was hailed by management people, who feel that only a few examples of this kind are necessary to bring labor relations back to a level keel," Business Week reported.28 When members of Local 600 moved for a strike vote against the penalties, the officers quickly adjourned the meeting. Business was resolved to "restore efficiency" and raise productivity in many cases below pre-war standards by breaking the de facto control of production won by workers during the war. To this end, employers demanded from the unions "company security" against wildcats and recognition of management's "right to manage." The unions' program after the war was, as industrial relations specialist Clark Kerr put it, "a continuation substantially of the status quo. "35 Union officials set as their main bargaining objective the maintenance of wartime incomes. Through loss of overtime and down grading of workers, the weekly wages of non-war workers decreased 10 percent between spring 1945 and winter 1946; war workers lost 31 percent36 and were making 11 percent less-spendable income than they were in 194137. A government study released in May 1946 found that "in most cases, wages during the first phase of reconversion were inadequate for the maintenance of living standards permitted by earnings in the year preceding the Pearl Harbor attack. "38 To compensate for these losses and to re-establish rank-and-file support, the unions bargained for substantial increases in hourly wages. With the end of the war, the expected strike wave began. In September 1945, the first full month after the Japanese surrender, the number of work days lost to strikes doubled. It doubled again in October.39 Forty-three thousand oil workers struck in twenty states on September 16.40 Two hundred thousand coal miners struck on September 21 to support the supervisory employees' demand for collective bargaining. Forty-four thousand Northwest lumber workers, seventy thousand Midwest truck drivers, and forty thousand machinists in San Francisco and Oakland all struck. East Coast longshoremen struck for nineteen days, flat glass workers for 102 days, and New England textile workers for 133 days.41 These were but a prelude to the great strikes of 1945 and 1946. Three days after Japan surrendered, the United Auto Workers requested from General Motors a 30 percent increase in wage rates without a price increase to maintain incomes. The company offered a 10 percent cost-of-living increase and told the union its prices were none of the union's business. United Auto Workers president R.J. Thomas stated he hoped that a settlement could be reached "without a work stoppage," but by early September some ninety auto and auto parts plants around Detroit were already on strike, and the union decided to order a strike vote.42 When GM failed to respond to a union offer to have all issues settled by arbitration if the company would open its books for public examination, 225,000 workers walked out November 21. The government moved in quickly to contain the strike movement. As President Harry Truman wrote, "it was clear to me that the time had come for action on the part of the government. "48 In the auto dispute, he appointed a "fact-finding board" and appealed to the strikers to return to work pending its decision; similar boards followed for numerous other industries. The findings of the General Motors strike board, generally followed by the other boards as well, recommended a 19.5 percent wage increase, six cents above the corporation's last offer and a little more than half of what the union demanded as necessary to retain wartime incomes. General Motors refused to accept the recommendation. Nor did the unions generally attempt to combine their strength, even within the AFL or CIO. Each union made settlements without consideration of others still on strike. Thus the division of the working class that had been the source of so much criticism of craft unionism was reproduced on a larger scale by the new forms of industrial unionism. This contrasts with the high level of rank-and-file solidarity, indicated not only by the nationwide strikes of 1946 but also by general strikes in Lancaster, Pennsylvania; Stamford, Connecticut; Rochester, New York; and Oakland, California. The war integrated the American economy more than ever before. The conditions affecting workers in 1946 cut across industry lines, leading to the Closest thing to a national general strike of industry in the twentieth century. The potential capacity of the workers to paralyze not just one company or industry but the entire country was demonstrated. At the same time, even simple wage settlements affected the entire economy. Therefore the government took over the function of regulating wages for the whole of industry. In this situation, the trade unions played an essential role in forestalling what might otherwise have been a general confrontation between the workers of a great many industries and the government, supporting the employers. The unions were unable to prevent the post-war strike wave, but by leading it they managed to keep it under control. Nonetheless, they were unable to prevent wildcat strikes and other direct challenges by workers to management control. 3. Philip Murray, cited in Art Preis, Labor's Giant Step: Twenty Years of the CIO (New York: Pioneer Publishers, 1964), p. 198. 4. "Bridges' Setback," Business Week, March 18, 1944, pp. 83-84. 6. Davis, cited in Preis, p. 155. 10. Republic Steel Corporation, War Labor Report 325 (July 16, 1942): 340-41, cited in Seidman, p. 101. 11. Cited in Preis, p. 155. 13. Bureau of Labor Statistics, Bulletin 909 (1947): 1. 14. Davis, cited in Seidman, p. 134. 15. Bureau of Labor Statistics, Bulletin 878 (1946): 3. 17. Jerome F. Scott and George C. Homans, "Reflections on Wildcat Strikes," American Sociology Review (June 1947): 278. 21. Monthly Labor Review (April 1944): 783; (August 1944): 357; (November 1944): 1018. 25. Wall Street Journal, August 22, 1944; Monthly Labor Review (April 1944): 1218. 26. Business Week, November 25, 1944, p. 110. 27. Business Week, January 15, 1944, p. 88. 28. Business Week, March 18, 1944, pp. 88-89. 30. Handbook of Labor Statistics, Bureau of Labor Statistics, Bulletin 916 (1947): 137. 31. Bruce R. Morris, "Industrial Relations in the Automobile Industry," in Warne, p. 416. 32. C.I.O. News, April 2, 1945, cited in Preis, p. 257. 33. New York Times, July 30, 1944. 34. Business Week, December 16, 1944, p. 82. 35. Clark Kerr, "Employer Policies in Industrial Relations, 1945 to 1947," in Warne, p. 45. 36. Bureau of Labor Statistics, Bulletin 876 (1946): 8. 43. Bureau of Labor Statistics, Bulletin 918 (1947): 8. 48. Harry S. Truman, Memoirs, vol. 1 (Garden City: Doubleday, 1955), p. 498. 49. Richard B. Johnson, Government Seizure in Labor Disputes (Philadelphia: University of Pennsylvania Press, 1948), p. 106. 52. H.M. Douty, "Review of Basic American Labor Conditions," in Warne, p. 130. 53. Peter F. Drucker, "What to Do About Strikes," Collier's, January 18, 1947, p. 12. 54. Frank T. De Vyver, "Collective Bargaining in Steel," in Warne, p. 390. 56. Fred H. Joiner, "Developments in Union Agreement," in Warne, pp. 40-41. 58. De Vyver, p. 390.